NASA has unveiled a flood of photos showing millions galaxies, stars and asteroids photographed by a prolific sky-mapping telescope that ended its mission earlier this year. For the first time, the space agency publicly released more than half of the 2.7 million images taken by its Wide-field Infrared Survey Explorer (WISE) telescope during its mission to map the entire sky. 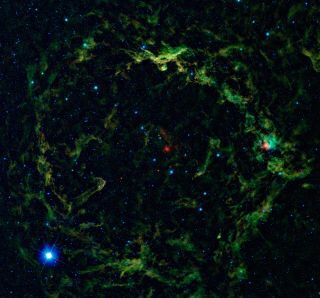 WISE's infrared eyes were especially useful for peering through dense layers of dust to capture stunning space photos of previously unseen objects in unprecedented detail. The telescope's observations have been used by mission scientists since they first started rolling in, but this is the first time a large amount of the data collected by WISE is being opened to the public, including scientists not affiliated with the project. Researchers are expecting the broadened exposure of the photos will enable a new wave of scientific discoveries. "Starting today thousands of new eyes will be looking at WISE data, and I expect many surprises," the mission's principal investigator Edward (Ned) Wright, of UCLA, said in a statement. While circling the Earth in a polar orbit, WISE captured images of faraway galaxies and nearby asteroids. During its tenure, the telescope surveyed the entire sky about 1 1/2 times in four different wavelengths of light. WISE discovered 20 new comets, more than 33,000 asteroids between Mars and Jupiter, and 133 near-Earth objects (NEOs), which are asteroids that come within 28 million miles (about 45 million kilometers) of Earth. The data released today includes about 57 percent of the photos taken by WISE over the course of its mission, NASA officials said. The remaining images will be released to an online archive in the spring of 2012. "We are excited that the preliminary data contain millions of newfound objects," said Fengchuan Liu, the project manager for WISE at NASA's Jet Propulsion Laboratory in Pasadena, Calif. "But the mission is not yet over — the real treasure is the final catalog available a year from now, which will have twice as many sources, covering the entire sky and reaching even deeper into the universe than today's release." So far, the WISE mission has released dozens of colorful images of the cosmos, in which infrared light has been assigned colors we see with our eyes. The whole collection can be seen at http://wise.ssl.berkeley.edu/gallery_images.html. The public archive for astronomers is online at http://wise2.ipac.caltech.edu/docs/release/prelim/index.html. Instructions for astronomy enthusiasts wanting to try their hand at using the archive are at http://wise.ssl.berkeley.edu/wise_image_service.html.